What further sets the DTI apart from other lesser isolation boxes is its connection versatility. We have provided XLR, 1/4" phone, and RCA type phono connections on all inputs and outputs. 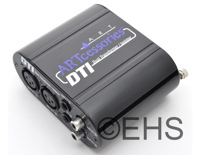 This allows it to easily fit into virtually any audio system and be the clean patch point between all types of systems. The compact black anodized all aluminum case and it's passive design allow the DTI to provide years of trouble free service in Live Sound, Permanent/Fixed Install, D.J., and virtually any PA application. It's full feature set, rugged construction, and high-end specifications make the DTI the obvious choice.